A favorite cookie tool of mine is the cookie scoop! No more "I want the big one!" from my kids. No more over baked or under baked cookies. I use the 2T. size for most of my recipes. (Mine is 1.5" wide and has what looks like a 18/8 number stamped on it.) I scoop up the cookie dough and scrape it against the side of the bowl to remove any excess. Now my kids want the cookie that has the most chocolate chips! A larger cookie scoop (or ice cream scoop) works great for scooping batter in muffin and cupcake recipes. A necessary tool is a cookie or baking sheet. In the past, I have thoroughly enjoyed my set of 3 aluminnum 12x17" baking pans. The sides are barely 3/4" high. I used parchment paper instead of greasing my pans for a quick cleanup; they did NOT fit in my dishwasher! 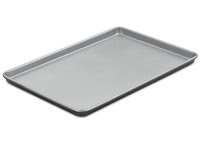 Look for heavy gauge aluminum pans that have low or no sides. Now I use and love my Cuisinart non-stick cookie sheets. (I found a set of 3 at Costco for $20) I wash those by hand to preserve the non-stick finish. They are very easy to clean up. I prefer to bake my cookies on the bottom side of my baking sheet, as it allows the air to circulate in my oven and evenly brown my cookies. I am fortunate to have a convection oven that helps with browning and allows me to bake 3 sheets at a time! If you find that your cookies are darker in the back of your baking sheet, you may have to rotate the pan mid-way through the baking time. If your baking sheets are dark, your cookies may over brown. Cookie sheets with a dull (not shiny) finish bake more evenly. Shiny cookie sheet are perfect for cookies that you DON'T want to be brown on the bottom, i.e shortbread. I prefer NOT to use the insulated cookie sheets. The cookies end up pale, thin, and spread out, with soft doughy centers. I let my cookies cool on the baking sheet, NOT a cooling rack. This helps firm up the centers of the cookie. I do not like doughy centers! Put your cookie dough on a cooled baking sheet each time. Putting dough on a hot cookie sheet causes the dough to start spreading before it is ready to bake, affecting the appearance and texture of your cookies. In the winter time, I put my baking sheets outside briefly to quickly cool in between batches. Cookie dough meant for shaping (i.e. sugar cookies) often needs to be chilled first for easier handling. (Less flour used in the rolling out process makes for a tender cookie!) The firmness of cookie dough after chilling depends on whether it is made with butter or margarine. Dough that is made with butter will be firmer. All margarines are NOT created equal. For the best results, choose the stick margarines containing at least 60 percent vegetable oil. If the spread has less than 60 percent oil; it will have a higher water content and give your cookies different results. Avoid spreads labeled diet, whipped, liquid, or soft; they are not for baking! Stick margarines containing corn oil will make a soft cookie dough, and you may have to adjust the chilling times in your recipe. Do not substitute oil for margarine in recipes. You will get a cookie that tastes and feels greasy. Cookies made with shortening tend to be crispier, while those made with butter tend to be softer. Of course, the flour/oil ratio, oven temperature, cookie size and how long you bake your cookie help determine the outcome! My perfect cookie has a 50/50 ratio of shortening and butter or margarine. Cookies are done when they are not shiny on the top. With some cookies (batter-type or soft sugar) you may need to touch the tops slightly. If the cookie springs back up and no indentation is left, the cookie is done. Place cooled cookies in an airtight container. Do not frost. To freeze, put cookies in a single layer with wax or parchment paper between layers of cookies. Store for up to 6 months. Cookie dough can be shaped and then frozen on a baking sheet. After about an hour in the freezer, remove the cookie dough and place in a freezer safe plastic bag for up to 6 months. To use, remove from the bag and bake as directed, adding a minute or two the the baking time. This is so great! 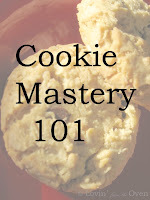 I want to try ALL of your cookie recipes! !